admin, Author at Carload Express, Inc.
Westmoreland County Industrial Development Corporation (WCIDC) has announced the recent ground breaking of Commerce Crossing at Westmoreland, a new industrial park near Waltz Mill, Penn., served by Southwest Pennsylvania Railroad (SWP), a subsidiary of Carload Express, Inc.
Oakmont, PA, June 11, 2018 – Carload Express, Inc. announced expansion of rail freight service to the Commonwealth of Virginia, through the lease of 14.8 miles of rail line between Pocomoke City, Md. and Hallwood, Virginia. 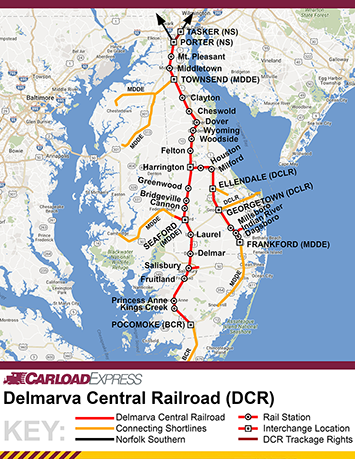 After the cessation of Bay Coast Railroad’s rail operations in May, Carload’s Delmarva Central Railroad (DCR) entered into a lease and operating agreement with the underlying landowner, Canonie Atlantic Co. (CAC), to restore and enhance rail service on the northern portion of the former Bay Coast Railroad. 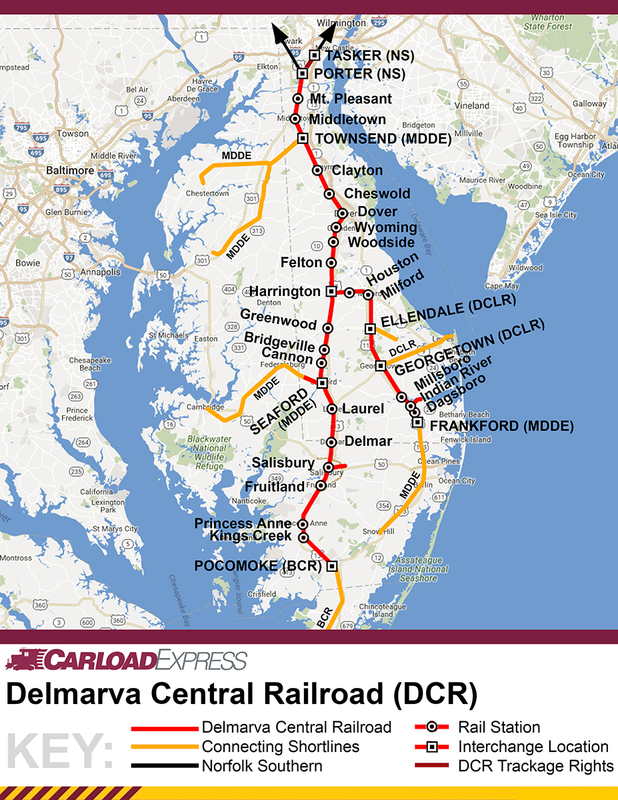 This portion of rail line will be served by DCR’s Delmar, Delaware, freight service, with connections to Norfolk Southern via DCR’s interchanges at Clayton and Tasker, Delaware. With this addition, Delmarva Central Railroad’s network totals 177 miles in three states, serving over 40 customers. Carload Express Inc. operates four shortline railroads: The Allegheny Valley Railroad (AVR) and Southwest Pennsylvania Railroad (SWP) serving western Pennsylvania; the Ohio Terminal Railway (OHIO) serving the Ohio River Valley bordering Ohio and West Virginia; and the Delmarva Central Railroad (DCR) serving Delaware, Maryland, and Virginia on the Delmarva Peninsula. The company handled 90,000 shipments last year, equating to roughly 360,000 fewer trucks on local highways, lowering congestion and road maintenance costs, while significantly reducing carbon emissions and greenhouse gases. The company and its 85 employees operate 24 hours per day, seven days per week, serving over 100 customers on 333 route miles of track. For more information, please see: carloadexpress.com. At the center of the case has been clarification on the JRA’s interpretation of the Municipal Authorities Act and the JRA’s ability to deviate from longstanding common law precedents. The JRA orally announced, after it issued the written Request for Proposal (RFP), that a nine-out-of-ten majority vote would be needed to award the contract even when six of the board members had formally withdrawn from the RFP process entirely. This result means that Carload Express is now authorized to succeed Susquehanna Union Railroad Co., in the operation of five shortline routes in Centre, Lycoming, Northumberland, Mifflin, Montour, Columbia, and Clinton Counties. “Carload Express applauds the decision of the Commonwealth Court, which lifts the cloud of confusion and uncertainty that had been hindering the JRA’s RFP process and has delayed a new operating agreement for more than two years,” said chairman Russell Peterson. “Since that time, Carload Express nearly doubled its locomotive fleet to a total of 44 and started operations on its new Delmarva Central Railroad subsidiary in Delaware and Maryland, which serves customers on 162 miles of track. In 2014, the JRA issued an RFP for a new operating agreement for a freight operator on the JRA’s lines. The JRA’s Board of Directors consists of 16 members appointed by the JRA’s eight member counties. Based on their existing relationships with companies that deal directly with the JRA’s incumbent freight provider, six board members felt it necessary to withdraw from the RFP process to avoid the appearance of any bias in the RFP process. During the RFP process, the JRA announced that under its own independent interpretation of the Pennsylvania Municipality Authorities Act, it would require the affirmative votes of at least nine board members before awarding a new operating agreement to any candidate, even though only 10 board members would be voting. Carload Express had the highest point score at the end of the RFP process. On July 8, 2015, the JRA held a voting meeting attended by all 16 board members. Seven of ten voting members voted in favor of awarding the new operating agreement to Carload Express, three opposed, and the six withdrawn members were physically present and did not vote. Six of the eight counties that make up the JRA cast a vote in favor of Carload Express as the next operator of the JRA lines. Based on its prior announcement of the nine-vote requirement, the JRA took the position that the final vote count had failed to meet its own requirements to award the operating agreement. The JRA then filed a lawsuit in the Court of Common Pleas of Clinton County, where the JRA maintained that the Pennsylvania Municipal Authorities Act requires no less than nine affirmative votes when 16 board members are physically present but six board members do not vote. While the Clinton County trial court initially sided with the JRA, holding that nine votes were required under the facts of the case, the Commonwealth Court reversed that decision on appeal. The Commonwealth Court, which is the Pennsylvania appellate court that specializes in public-sector laws and government regulation, held that the Municipal Authorities Act does not override the longstanding common law rules of voting. The 7–3 vote held by the JRA’s Board of Directors passed the motion to award the new operating agreement to Carload Express. The Commonwealth Court held that the JRA did not have the ability to impose a nine-vote requirement in the absence of a formal amendment to its bylaws, which had not been amended. Further, the court held that because Carload Express received the highest score in the RFP process and received the necessary majority of the votes cast (7-3), Carload Express has a legal right to the immediate execution of a new operating agreement. Carload Express Inc. operates four shortline railroads: The Allegheny Valley Railroad (AVR) and Southwest Pennsylvania Railroad (SWP) serving western Pennsylvania; the Ohio Terminal Railway (OHIO) serving the Ohio River Valley bordering Ohio and West Virginia; and the Delmarva Central Railroad (DCR) serving Delaware and Maryland on the Delmarva Peninsula. The company handled 90,000 shipments last year, equating to roughly 360,000 fewer trucks on local highways, lowering congestion and road maintenance costs, while significantly reducing carbon emissions and greenhouse gases. The company and its 85 employees operate 24 hours per day, seven days per week, serving over 100 customers on 318 route miles. For more information, please see: carloadexpress.com. OAKMONT, Penna., January 31, 2018 – Carload Express, Inc. announces this week that Mark Rosner has been named President, effective immediately. Jim Streett has been promoted to the role of Chief Executive Officer. “We are excited to welcome Mark Rosner to our executive team, where his significant industry experience will prove to be tremendously valuable” said Russell Peterson who has been promoted to the new role of Chairman, as part of Carload Express’ corporate succession planning. Mr. Rosner has over 30 years of wide-reaching rail industry experience, ranging from U.S. short line, regional and Class I railroads to successful startups and turnarounds worldwide. Mr. Rosner earned a Bachelor of Science in Business Administration from Alfred University and a Master of Business Administration from Duke University. Carload Express Inc. operates four shortline railroads: The Allegheny Valley Railroad (AVR) and Southwest Pennsylvania Railroad (SWP) serving western Pennsylvania; the Ohio Terminal Railway (OHIO) serving the Ohio River Valley bordering Ohio and West Virginia; and the Delmarva Central Railroad (DCR) serving Delaware and Maryland on the Delmarva Peninsula. We handled 90,000 shipments last year, equating to roughly 360,000 fewer trucks on local highways, lowering congestion and road maintenance costs, while significantly reducing carbon emissions and greenhouse gases. For more information, please see: carloadexpress.com. OAKMONT, Pa. (Dec. 18, 2017) – Carload Express Inc. (CEI) today kicked off its 25th anniversary celebration by unveiling a new video that highlights the commitment of our employees to providing excellent rail service to our customers. The company was founded on Dec. 16, 1992, as Trimax Holdings, and rebranded as Carload Express in 1999. Today, CEI has 85 employees and operates four shortline railroads serving Pennsylvania, Ohio, Maryland and Delaware. The video can viewed here: http://carloadexpress.com/25th-video/ (or, see below). The company added a new timeline to its website to illustrate the company’s growth and milestones, which can be found here: http://carloadexpress.com/company-history/. In celebration of this milestone, for the next year, CEI will use the commemorative corporate logo featured above. CEI operates four shortline railroads: Delmarva Central, Allegheny Valley, Southwest Pennsylvania and Ohio Terminal railroads. Since beginning operations in 1992 with 4 locomotives handling 4,400 annual carloads, Carload Express has grown its traffic over 1,700 percent to handling nearly 90,000 carloads per year. Over the last year, Carload purchased 17 additional locomotives to support today’s operations and future company expansion, bringing the company’s fleet to 46 locomotives. A significant accomplishment was last year’s start-up of the 162-mile Delmarva Central Railroad in Delaware and Maryland. 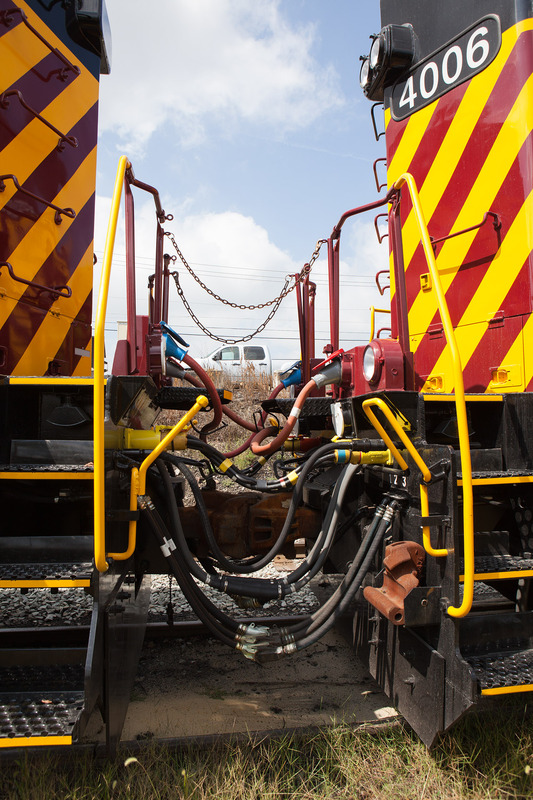 Within the first 48 hours of taking over the rail line, CEI subsidiary Delmarva Central Railroad Company (DCR) moved 12 additional locomotives into operation, established five offices and transitioned all communications systems. Within the first 90 days of operation, DCR moved nearly 6,500 railcars, provided all customers with five-day-per-week service (an increase of 150 percent in most cases), and suffered no injuries or derailments. DCR is managed locally in Harrington, Delaware. Carload Express 25th Anniversary from Carload Express on Vimeo. Carload Express Inc. operates four shortline railroads: The Allegheny Valley Railroad (AVR) and Southwest Pennsylvania Railroad (SWP) serving western Pennsylvania; the Ohio Terminal Railway (OHIO) serving the Ohio River Valley bordering Ohio and West Virginia; and the Delmarva Central Railroad (DCR) serving Delaware and Maryland on the Delmarva Peninsula. We anticipate handling approximately 90,000 shipments this year, equating to roughly 360,000 fewer trucks on local highways, lowering congestion and road maintenance costs, while significantly reducing carbon emissions and greenhouse gases. For more information, please see: carloadexpress.com. OAKMONT, Pa. (June 21, 2017) – Carload Express Inc. (CEI) today unveiled a video during the Summer 2017 Delmarva Freight Summit in Newark, Delaware, to mark its six-month milestone of operating the 162-mile Delmarva Central Railroad in Delaware and Maryland. Within the first 48 hours of taking over the rail line, CEI subsidiary Delmarva Central Railroad Company (DCR) moved 12 additional locomotives into operation, established five offices and transitioned all communications systems. Within the first 90 days of operation DCR moved nearly 6,500 railcars, provided all customers with five-day-per-week service (an increase of 150 percent in most cases), and suffered no injuries or derailments. DCR is managed locally in Harrington, Delaware. Freight operations are based out of Harrington, Dover, Seaford and Delmar. The lines run from near Porter, Delaware (south of Wilmington), south to Pocomoke City, Maryland; and from Harrington, Delaware, to Frankford, Delaware. DCR is the fourth shortline railroad operated by Carload Express, joining Allegheny Valley, Southwest Pennsylvania and Ohio Terminal railroads. Since beginning operations in 1992 with 4,400 annual carloads, Carload Express has grown its traffic over 1,700 percent to nearly 80,000 carloads per year. Carload recently purchased 17 additional locomotives to support operations and future company expansion, bringing the company’s fleet to 44 locomotives. Celebrating Six Months of the Delmarva Central Railroad from Carload Express on Vimeo. Carload Express Inc. operates four shortline railroads: The Allegheny Valley Railroad (AVR) and Southwest Pennsylvania Railroad (SWP) serving western Pennsylvania; the Ohio Terminal Railway (OHIO) serving the Ohio River Valley bordering Ohio and West Virginia; and the new Delmarva Central Railroad (DCR) serving Delaware and Maryland on the Delmarva Peninsula. We anticipate handling approximately 80,000 shipments this year, equating to roughly 320,000 fewer trucks on local highways, lowering congestion and road maintenance costs, while significantly reducing carbon emissions and greenhouse gases. For more information, please see: carloadexpress.com. OAKMONT, Pa. (May 31, 2017) — Carload Express announced this month that it has received two awards for its marketing work at Norfolk Southern’s 16th annual shortline meeting in Norfolk, Virginia. Carload Express Inc. operates four shortline railroads: The Allegheny Valley Railroad (AVR) and Southwest Pennsylvania Railroad (SWP) serving western Pennsylvania, the Ohio Terminal Railway (OHIO) serving the Ohio River Valley bordering Ohio and West Virginia, and the new Delmarva Central Railroad (DCR) serving Delaware and Maryland on the Delmarva Peninsula. We anticipate handling approximately 80,000 shipments this year, equating to roughly 320,000 fewer trucks on local highways, lowering congestion and road maintenance costs, while significantly reducing carbon emissions and greenhouse gases. OAKMONT, Pa. (NOVEMBER 18, 2016) – The Delmarva Central Railroad Company (DCR), a subsidiary of Carload Express Inc. (CEI), has filed with the federal Surface Transportation Board to lease and operate 162 miles of rail line in Delaware and Maryland. The line is owned and currently operated by Norfolk Southern Corporation (NSC). DCR expects to create more than 30 new jobs as part of its operations. The lines run from near Porter, Delaware (south of Wilmington), south to Pocomoke City, Maryland; and from Harrington, Delaware, to Frankford, Delaware. Pending Surface Transportation Board approval, DCR expects to begin operations in December 2016. DCR will be managed locally from offices in Harrington, Delaware. Freight operations will be based out of Harrington, Seaford and Delmar. 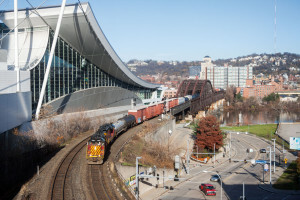 DCR will become the fourth shortline railroad operated by Carload Express, joining Allegheny Valley, Southwest Pennsylvania and Ohio Terminal Railroads. Since beginning operations in 1992 with 4,400 annual carloads, Carload Express has grown its traffic over 1,700 percent to nearly 80,000 carloads per year. Carload recently purchased 17 additional locomotives to support operations and future company expansion, bringing the company’s fleet to 46 locomotives. Employment applications for positions on DCR are being accepted. Please visit http://carloadexpress.com/employment/openings/, email dcr-jobs@carloadexpress.com, or call 302-846-7820 for more information. Carload Express Inc. is a shortline railroad holding company with four railroads: The Allegheny Valley Railroad (AVR) and Southwest Pennsylvania Railroad (SWP) serving western Pennsylvania; the Ohio Terminal Railway (OHIO) serving the Ohio River Valley bordering Ohio and West Virginia; and the new Delmarva Central Railroad (DCR) serving Delaware and Maryland on the Delmarva Peninsula. In 2015, we handled nearly 80,000 shipments, equating to roughly 320,000 fewer trucks on local highways, lowering congestion and road maintenance costs, while significantly reducing carbon emissions and greenhouse gases. For more information, please see: carloadexpress.com. On Saturday, November 19th 2016, railcar owners from the Northeastern United States will be riding on the Southwest Pennsylvania Railroad from Mount Pleasant to Greensburg, Penn., stopping at: Cook’s Lumber in Mount Pleasant, the SWP Train Station office in Scottdale, the PA Rt 31 crossing in Tarrs, Supervalu Inc., Youngwood Railroad Museum, and Greengate Rd behind Walmart at the Railroad crossing, and then return. The trip will collect toys and cash donations for the U.S. Marines’ annual Toys for Tots campaign. This will be the first year that SWP has hosted NARCOA. Southwest Pennsylvania Railroad employees have been collecting toys to prepare for this event. NARCOA is a national organization that restores railcars and charters railroads around the country for excursions. The railcars, also known as “speeders”, were used by the railroads for track inspection and maintenance. Most railroads now use trucks equipped with rail wheels and so the older railcars were sold off to individuals. For more information on NARCOA, visit their website. The group will be leaving Mount Pleasant at the Savage Intermodal Terminal at 8:00 AM, arriving at Cook’s approx. 8:20 AM, Scottdale approx. 10:15 AM, Tarrs approx. 11:15 AM, Youngwood approx. 12:45 PM, Greensburg approx. 2:00 PM, and then return, stopping at the same locations for about 15 minutes each as time and daylight allow. Times are approximate based on weather conditions. Please meet us along the tracks with your donations, safely flag us down and we will gladly stop. (Please stay off of and away from the tracks.) A new, wrapped toy for either a boy or girl will make an underprivileged child very happy this holiday season. All toys and donations collected on this trip will be used in Westmoreland County. In 2015, the group collected 2 pickup loads of toys which were desperately needed to fill requests. They also raised almost $3,000. There are many families in the area that are finding it difficult to provide toys for their children this year. Your help will make many Christmas brighter this year with your thoughtful donations. For questions, please email Event Coordinator John Gonder. 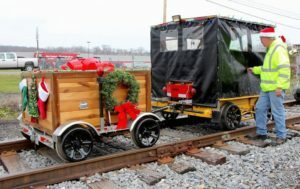 If you are unable to meet the railcar riders along the tracks, please drop off a toy (or several) at any Toys for Tots drop-box. Thank you for your kindness and generosity. John Gonder of Ruffs Dale, PA has his motorcar and TOY BOX trailer decorated for the annual Toys for Tots ride in Central Pennsylvania in December, 2015. Carload Express Inc. operates three shortline railroads: The Allegheny Valley Railroad (AVR) and Southwest Pennsylvania Railroad (SWP) serving western Pennsylvania, and the Ohio Terminal Railway (OHIO) serving the Ohio River Valley bordering Ohio and West Virginia. Our dedicated, locally based management is able to offer timely and flexible service demanded by today’s fast-paced supply chains while offering the inherent economies of scale that rail shipping provides. Our multiple connections to the North American rail system allow our customers to enjoy competitive freight routing options, lowering their overall shipping costs. Carload Express Inc. plays an important role in the communities we serve by transporting many of the basic goods used in everyday life, such as: the paper we read; the food we eat; the bricks, steel and lumber we use for homebuilding; and the energy that supplies power for those homes. The nearly 80,000 shipments we handle annually equate to roughly 320,000 fewer trucks on local highways each year, lowering congestion and road maintenance costs while significantly reducing carbon emissions and greenhouse gases. 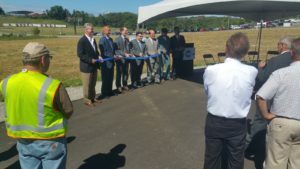 Fay-Penn Economic Development Council has announced the opening of Phase I of the Dunbar Township Business Park, located along Route 119 and Pechin Road, with the immediate availability of eleven “shovel ready” sites. Carload Express, Inc. personnel were in attendance at the Grand Opening ceremony that was held in July, and congratulate Fay-Penn on this significant accomplishment. Planning for the new business park began in 2011 to address a critical shortfall in available land to accommodate the influx of gas, energy and advanced technology companies. 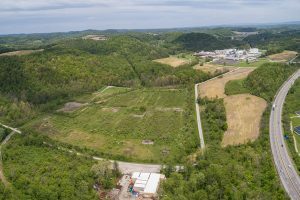 This $4.8+ million project began in 2012 when Fay-Penn purchased a 207-acre site along Pechin Road, and an additional 104 acres of adjoining property located along the Southwest Pennsylvania (“SWP”) Rail line. The SWP line borders almost a mile worth of frontage within the Dunbar Township Business Park, providing the potential for rail service to a substantial portion of the planned development. Approximately 80 acres in Phase I are now fully-developed with roads, utilities and street lighting in-place. It is estimated that 250+/- saleable acres will be available upon completion of all three phases. When fully developed, Fay-Penn anticipates that the park will accommodate approximately 1,100 new, permanent jobs and generate $44 million in annual payroll, $8.4 million in annual real estate tax, and $110 million in local economic impact. Fay-Penn Executive Director Bob Shark stated that “these types of site development projects don’t just happen overnight. The Dunbar Township Business Park is the realization of many years of planning and work. The park offers a number of business amenities: significant land area to handle various types and sizes of businesses, rail accessibility, and proximity to major markets in Pittsburgh and Morgantown, the Joseph A. Hardy Airport, easy access to several major highways, and the Penn State Fayette Campus. It’s also in the heart of the Marcellus Shale region. For more information about rail service to the Dunbar Township Business Park, please contact Mike Filoni at (412) 426-2600 or mikefiloni@carloadexpress.com. Carload Express has been selected as a 2016 Fast Track Award winner by GE Transportation at the 2016 Client Conference in Atlanta, Ga. GE’s Fast Track Award recognizes customers who achieved measurable success through the use of GE Transportation’s software and solutions, and whose results set them apart as an innovator in the rail and rail shipper industry. 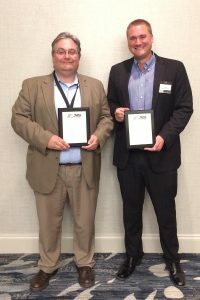 OAKMONT, Pa. (May 18, 2016) — Carload Express announced today that it has received several awards for its marketing work at Norfolk Southern’s 15th annual shortline meeting in Norfolk, Virginia. OAKMONT, Pa. (May 18, 2016) — Carload Express railroads and customers will benefit from several grant awards by Gov. Tom Wolf through the Pennsylvania Department of Transportation (PennDOT). The grants were awarded through the Rail Transportation Assistance Program (RTAP), a capital budget grant program funded with bonds. In Fayette County, D&I Silica will receive $1.3 million to extend the switching lead track and two unloading pit yard tracks, replace track, and relocate a turnout to create a yard for operational flexibility. Also in Fayette County, the SWP will receive $2 million to install five-yard tracks and a runaround track to improve Bowest Yard. 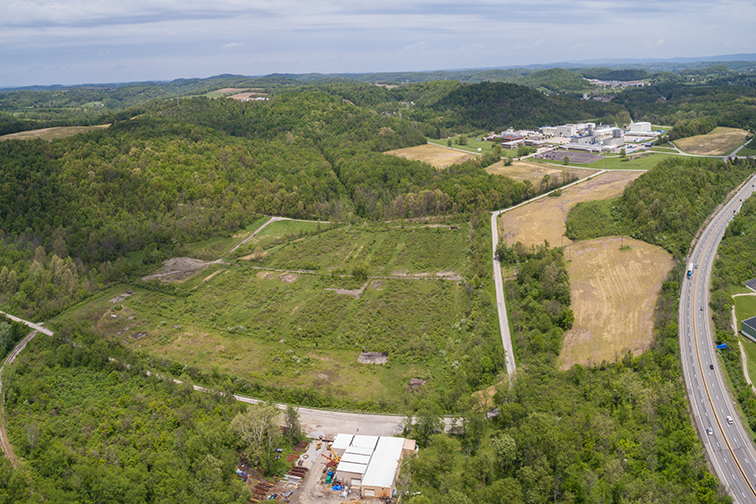 In Westmoreland County, in partnership with Westmoreland County Industrial Development Corporation, $1.1 million has been awarded to replace existing rail and steel components on the Radebaugh Subdivision. Carload Express appreciates the support of Gov. Wolf, state lawmakers and the Commonwealth of Pennsylvania for this vital program. These enhancements will allow us to continue to invest in our shortlines that provide critical transportation infrastructure needs for our region’s businesses that rely on rail to deliver their goods. Carload Express, Inc. announces that its Camp Chase Railroad Company has sold its line of railroad to Camp Chase Railway Company, LLC; a wholly-owned subsidiary of Indiana Boxcar Corporation. Camp Chase Railway (“CAMY”) assumes operations of the 14-mile rail line, which runs from Columbus to Lilly Chapel, Ohio, beginning Thursday October 1, 2015. Indiana Boxcar Corporation was founded in 1988 and presently owns 3 other short line railroads operating in Pennsylvania, Ohio, Indiana, and Illinois. Carload Express, Inc. operates three shortline railroads: The Allegheny Valley Railroad (AVR) and Southwest Pennsylvania Railroad (SWP) serving western Pennsylvania, and the Ohio Terminal Railway (OHIO) serving the Ohio River Valley bordering Ohio and West Virginia. 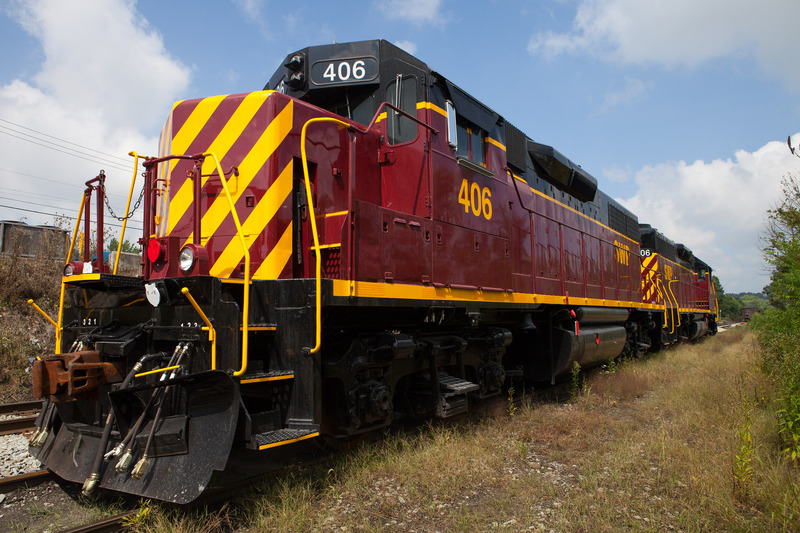 Last week, Southwest Pennsylvania Railroad accepted delivery of locomotive SWP 4006 & SWP 406. 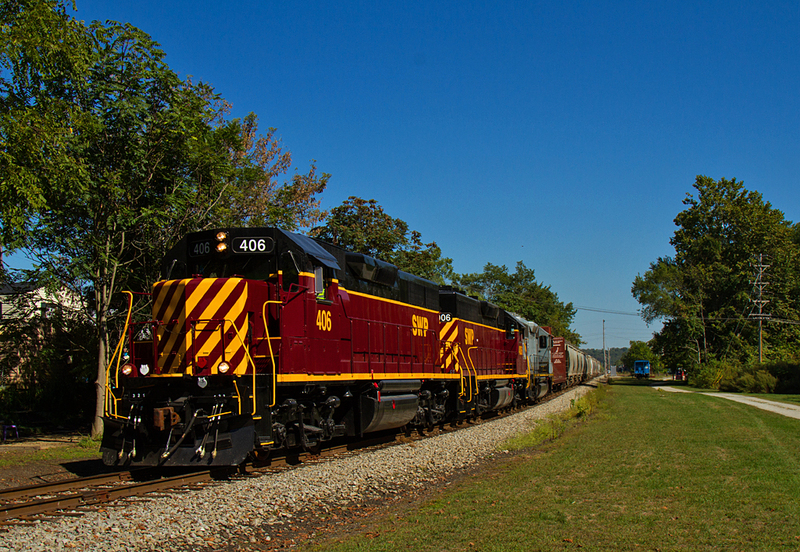 This fuel-efficient pair features a GP40-2 mated to a GP38 core that was rebuilt into a slug unit. The resultant locomotive, which we call an “HD40-2”, is essentially a 3000 HP diesel-electric with 8 powered axles and two fuel tanks. 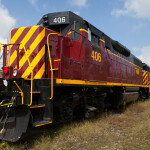 SWP 4006 was rebuilt and repainted, and SWP 406 was constructed from a former Penn Central GP38 as a tractive effort booster unit. This work was completed by Metro East Industries, Inc. of St. Louis, Ill.
Newly-arrived SWP 406-SWP 4006 Road Slug-GP40-2 pair, dubbed by SWP as “HD40-2”. SWP 406 in revenue service in Youngwood, Pa. Bob Shook photo. Carload Express congratulates Jaime Garayua of Sulmona Energy, LLC as the winner of our DUG East conference prize. Jaime won a framed photo of an Allegheny Valley Railroad train passing the David L. Lawrence Convention Center in Pittsburgh, taken by our own Mike Filoni. Carload Express, parent company of the Allegheny Valley (AVR), Southwest Pennsylvania (SWP), Camp Chase (CCRA), and Ohio Terminal (OHIO) railroads, has submitted a proposal to operate rail lines owned by the SEDA-COG Joint Rail Authority (the JRA) in Central Pennsylvania. The selected rail operator would commence operations over the JRA’s lines on July 1, 2017. The JRA expects to make a decision to select an operator on July 8, 2015. In addition to our written proposal, Carload Express made a presentation to the JRA on May 4, 2015. Our PowerPoint presentation, Change Worth Making, is available at our website on www.carloadexpress.com/news. In our presentation, we highlight our proposal’s increase in safety, increase in track maintenance, increase in rail freight service, and increase in marketing and industrial development strength. Communities benefit from a safe, efficient operator with an excellent track record for growth – 37% annual average growth over the last 5 years! We thank the JRA for the opportunity to participate in this historic process. View our May 4, 2015 PowerPoint Presentation (Adobe PDF), entitled Change Worth Making. Carload Express, Inc. operates four shortline railroads: The Allegheny Valley Railroad (AVR) and Southwest Pennsylvania Railroad (SWP) serving western Pennsylvania, the Camp Chase Railroad (CCRA) serving central Ohio, and the Ohio Terminal Railway (OHIO) serving the Ohio River Valley bordering Ohio and West Virginia. Our dedicated, locally based management is able to offer timely and flexible service demanded by today’s fast paced supply chains while offering the inherent economies of scale that rail shipping provides. Our multiple connections to the North American rail system allow our customers to enjoy competitive freight routing options, lowering their overall shipping costs. Carload Express, Inc. plays an important role in the communities we serve by transporting many of the basic goods used in everyday life such as the paper we read, the food we eat, the bricks, steel, and lumber we use for homebuilding, and the energy that supplies power for those homes. The 50,000 shipments we handle annually equate to roughly 200,000 fewer trucks on local highways each year, lowering congestion and road maintenance costs while significantly reducing carbon emissions and greenhouse gases. We credit our employees for this success, as their hard work delivers excellent results. The entire Carload Express team is grateful for this recognition and for our outstanding relationship with Norfolk Southern. 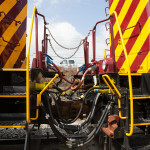 Our Locomotive Conductor Trainee job openings now include a position in the Columbus, Ohio area. Please see the Job Opening page for details.